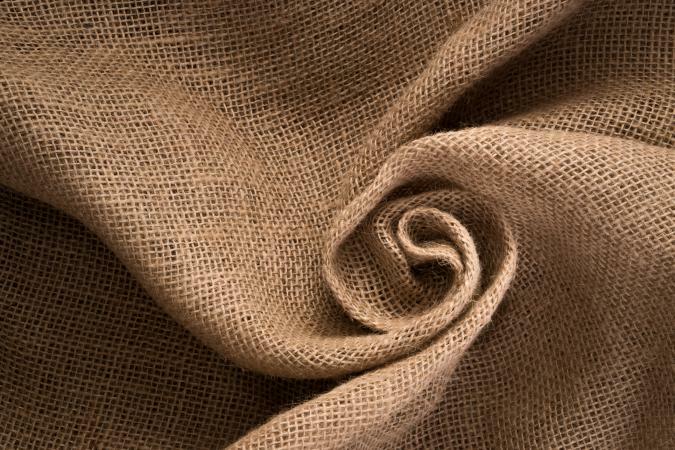 Linen (flax) is considered to be one of the oldest textile fibers. Linen, the commonly used term for flax, a bast fiber, comes from the stem of the flax plant. Flax plants are either raised for their fiber or for the linseed oil harvested from flax seeds. Scientists have traced linen textiles to prehistoric times. Linen cloth was found among the artifacts of Swiss Lake Dwellers dating from 8000 B.C.E. When Tutankhamen's tomb was opened, linen curtains placed in the tomb circa 1250 B.C.E. were still identifiable. Linen was introduced to the Roman Republic by Phoenician traders who originally came from the eastern Mediterranean region. As the Roman Empire spread, so did the use of linen textiles. By the Middle Ages, German and Russian regions were major sources of fiber, while Northern Ireland, Belgium, England, Scotland, and the Netherlands established industries well known for production of linen textiles. It is from this historical development that Irish Linen became a household name and continues in 2004 as a label associated with genuine linen fiber content. Linen production in North America, and then in Europe, became less important due to an emphasis on producing cotton that began in the eighteenth century. Argentina and Japan joined in production of linen midway into the twentieth century and production in the early twenty-first century extends to New Zealand and China. Russia, Poland, Northern Ireland, Egypt, France, and Belgium are the key producers of linen for the global marketplace. The limitation of requiring hand labor to produce linen fiber, compared to the ongoing mechanization of cotton, also contributed to limited production of linen goods. Linen is cellulosic and thus has aesthetic, comfort, and performance characteristics reminiscent of cotton and rayon textiles. These include high absorbency, low insulation, a tendency to be cool in hot temperatures. Linen textiles are additionally famous for their ability to "wick," a form of moisture transport known for providing a cooling effect in hot temperatures via drying quickly. Linen is not subject to linting, the shedding of fibers that can result in bits of fiber lying on the surface of the textile. It is therefore ideal for drying dishes and for appearance retention in apparel. While twice the strength of cotton, linen is highly subject to wrinkling and thus is reputed to produce "prestigious wrinkles." Wrinkling is diminished when fibers are long and fine, and yarns are flexible. Wrinkle-resistant finishes have been applied to many cellulosic fibers as another way to reduce this tendency to wrinkle. Natural colors for linen fibers include buff and gray. White and pure colors are obtained through bleaching. Highly bleached textiles have lower strength and durability than those with natural color or tonal variations of color resulting when linen is not heavily bleached before dyeing. Dyeing linen is challenging because fibers resist absorbing dyes and fade easily. It has become a tradition that linen textiles are quite often in the buff, tan, and gray colors associated with the look of linen. Dirt and stains are resisted by flattened smooth surfaces. Linen has high heat resistance, is stronger wet than dry, and withstands cleaning, pressing, and creasing very successfully. Abrasion can break fibers on creases due to low resiliency. Linen textiles are flammable and are subject to damage from mildew, perspiration, bleach, and silverfish. Knitwear has considerable design potential for linen apparel. The flexibility of the knit structure compensates for linen's tendency to wrinkle, yet the textile retains all the comfort factors of natural linen. 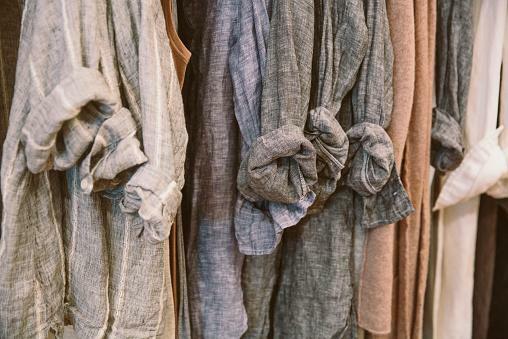 Many fabrications appear to be linen. By achieving the visual effect of linen, many textiles are called linen even when fiber content includes little or no linen fiber. For example, textiles labeled linen are often actually either rayon or polyester, or a blend of both fibers. These two fibers that have great propensity to imitate the prestigious look of linen while lowering the cost and sometimes increasing performance in terms of wrinkling and shrinkage without losing the "look of linen." Rayon textiles come a close second with regard to the absorbency, feel on the skin, and similar tendency to wrinkle. Polyester textiles can eliminate the need for ironing. Raw silk and linen suiting textiles can have a quite similar visual aesthetic, yet touching either textile reveals that linen will always have a crisper and dryer feel than silk. Linen supports keeping the body cool, while raw silk is known for keeping the body warm. Another fiber that has been widely used in imitating linen is ramie. Ramie (also known as China grass due to its origin in China and Asia) has much of the look of linen but is not subject to import quotas, as is linen. Therefore, it is commonplace to find ramie instead of linen as the fiber content for a great many "linen" textiles. Ramie is naturally white so can be dyed a broader range of colors more easily than linen, and thus the products can be stronger since less processing is needed to reach the final product. There is a tendency for these relatively shorter fibers (from 6-8 inches) to produce textiles that have an inherent scratchiness rather than the smoothness of linen. Thus, ramie products tend to be more successful as interior textile products. With the end of fiber quotas, it is expected there will be a moderation in the use of ramie in linen-like products as designers seek creation of high-quality goods. Collier, B., and P. Tortora. Understanding Textiles. 6th ed. New York: Macmillan Publishing, 2000. Hatch, K. Textile Science. Minneapolis: West Publishing, 1993.